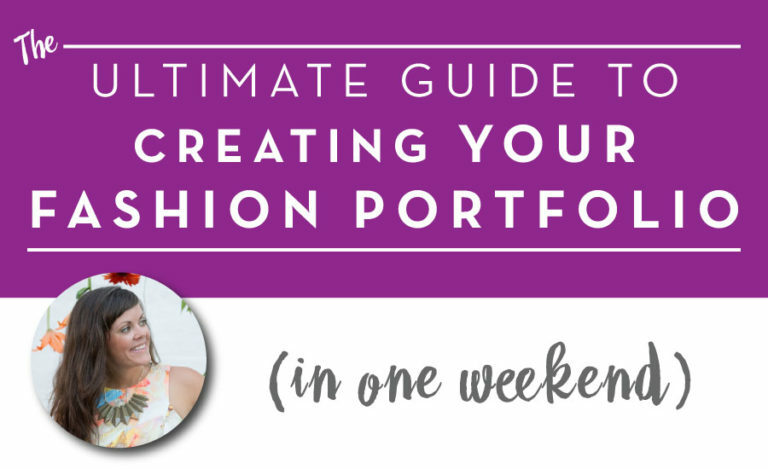 Many designers get stuck on what fashion portfolio layout to choose. The thought of keeping an online website, a PDF and a physical book for your fashion portfolio up to date can be overwhelming. In this chapter, we’ll discuss what portfolio layouts you do – or don’t – need, and some simple tricks to easily (and quickly) keep everything updated. 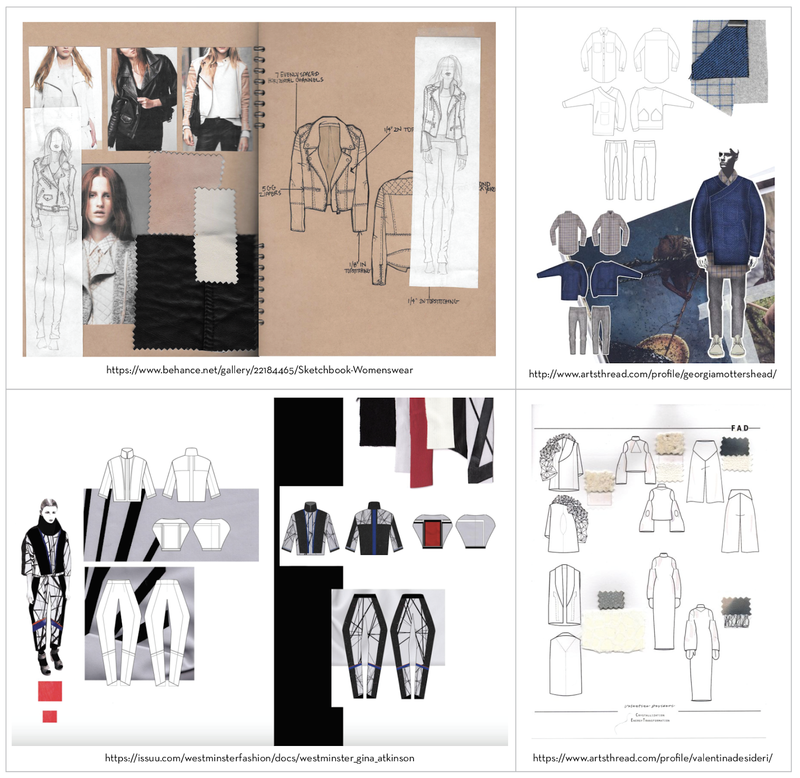 What is the industry preferred format for a fashion design portfolio? Digital or physical book? Both? In most cases, you’ll want to have both. You’ll use your digital portfolio to apply for / email brands about opportunities, and you’ll use your physical book during an interview. While there are exceptions and some fashion designers get away without both , I suggest being prepared. I’ve never kept an updated “physical” portfolio. The majority of my work has been remote freelance, and most clients come from trusted referrals and networking. Often, we never even meet before beginning a project. If there is an in person meeting, I bring catalogs and physical samples to share, or they’re already familiar with my work from the referral. Sometimes, I’ll put a quick PDF together to show them relevant work examples or some ideas for their project, but I’ve never had an up to date “book”. While you may think I am an exception, I know other freelancers who operate the same. I also know some who have books. If you’re looking for true remote freelance work, a physical book is less important and you can probably get away with just a digital portfolio. But for full-time jobs or “temp” work, having both is ideal if not required. But don’t worry. Because your digital fashion portfolio doesn’t have to be super fancy or take you months to put together. You don’t have to hire a web developer or know how to write HTML. You don’t even have to create a website. And your physical fashion portfolio doesn’t have to be overly complex and you don’t need an expensive book. We’ll go through step by step how you can easily assemble your printed book (and quickly update it in a pinch). What books / sizes / specs etc are best for physical fashion portfolio layouts? Depending on the types of brands you work with (Gucci vs Walmart), this may vary. But in general, you want your portfolio to show that you put some creativity and care into it. While researching for this book, I talked to a lot of hiring managers and recruiters. Bottom line? No one wants to see a generic folder from Staples with sheet protectors. Your portfolio shouldn’t look like a board meeting report. You are a FASHION DESIGNER! Show that you are CREATIVE! Show that you can be INNOVATIVE! Show that you come up with interesting solutions to solve problems! And I know one of the problems many of you have…it’s dropping $150 cold hard cash on a huge portfolio from a fancy art store. And I get it. I remember the first nice book I bought…I saved up for that bad boy and it killed me to drain my savings for it. I know many of you are still in school or struggling to make ends meet…and I’m not saying you need to spend that kind of moolah on a book. Which is why I’m going to show you how to make your own book in one night for less than $50. First, figure out what size you want your book to be. Easiest way to do this? Use a default paper size. Bristol board is a great option for the pages of your fashion portfolio, so pick a mid paper weight and one of their standard sizes. I’d suggest a size with “some” impact like 11×14″ or 14×17″, but whatever you want is fine . The larger the size, the heavier the paper. I suggest going to a local craft store to feel for yourself and picking something sturdy for your size. So bust out that 40% off Michael’s coupon and go get your bad self some Bristol board. Next, make your own book. Once you know the size, your creativity comes into play. There are plenty of DIY ways you can create an awesome cover with a small budget. Pinterest has some great options. Spend 20 minutes, find the inspo you love, and make it. Get crafty and find something around your house or a cheap piece of lightweight wood from the hardware store that you can cover with fabric. You’re a fashion designer, and you’re creative. You can do this. Now that you’ve got a blank book put together, how do you actually get your work in there? We’ll cover that next. Where do you get large pages printed for oversized portfolios? Large format printing can be costly and inconvenient. But standard paper sizes (8.5×11″ or A4) are seen as a boring. Which is why you’re not going to worry about printing your work directly on the large pages of your fashion portfolio. Instead, you’re going to print your work on standard printer size cardstock or a nice presentation paper (I’ve always loved Epson’s presentation paper, but get whatever you can locally that’s a step up from plain printer paper). Then, you’ll collage your layout onto the Bristol board pages using removable / repositionable tape (a trick from one of my readers, Filiz – thank you Filiz!). 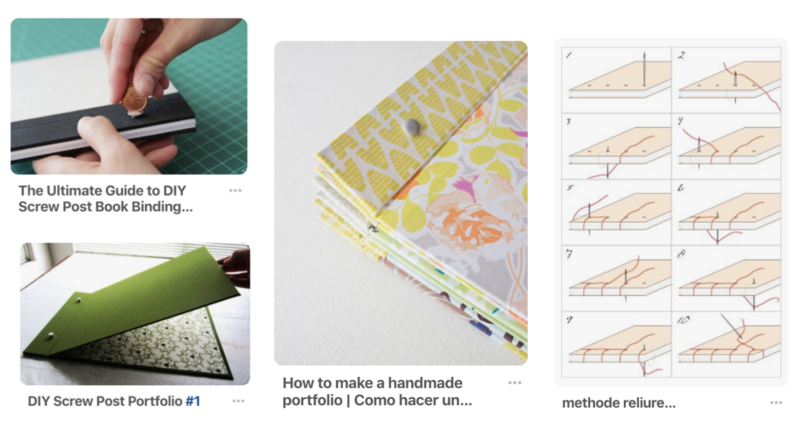 This works great because you 1) get to reuse your Bristol Board pages over and over and 2) can easily customize your book for any opportunity (more on how to do this later). Maybe you print full pages and just tape each page in with fabric swatches and color chips below . 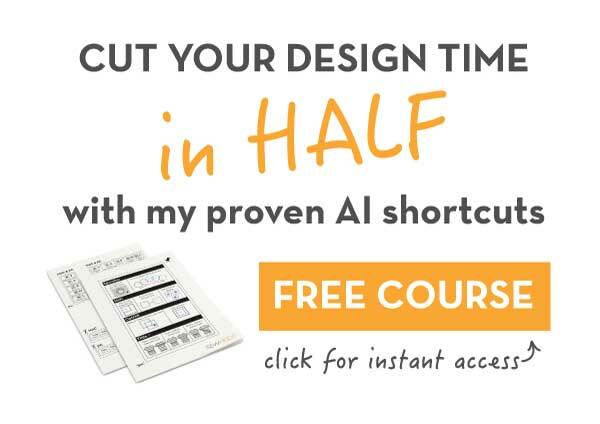 Maybe you print pages, cut out individual designs, and collage them onto the Bristol board. Choose whatever works for your aesthetic and use your creativity as a fashion designer . Yes, you should include fabric and color swatches in your physical portfolio to add a touch and feel aspect. You can also include these in your digital book as scans or photos. 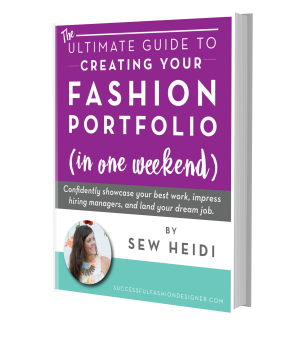 Use the examples shared in this book and interpret for your own portfolio. Be mindful of how “creative” you get. If you’re going after high fashion brands, you have more opportunity to be artsy. If you work with less fashion forward brands, you may not want to get too abstract. What’s the best platform to digitally create your fashion design portfolio online? 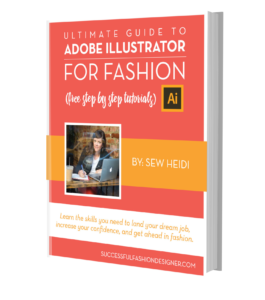 While it can feel overwhelming that you need two versions of your fashion portfolio layout, the digital version doesn’t have to be that hard to put together. Now, my advice may contradict what others tell you, but I feel really strongly about this and I’m a big proponent in keeping things simple. Which is why I suggest creating your fashion portfolio as a PDF (specific tech tips in just a sec). It’s easy to put together, doesn’t require messing with websites, HTML, URLs or anything like that. 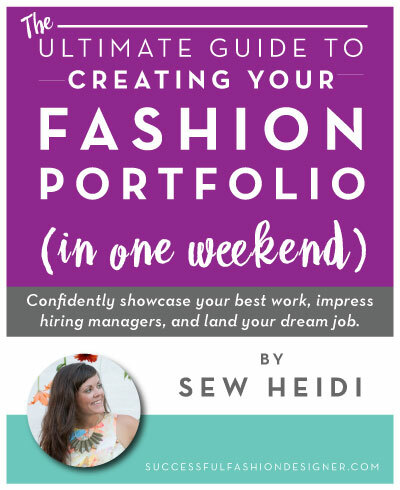 What’s the best way to share your fashion design portfolio as a PDF? 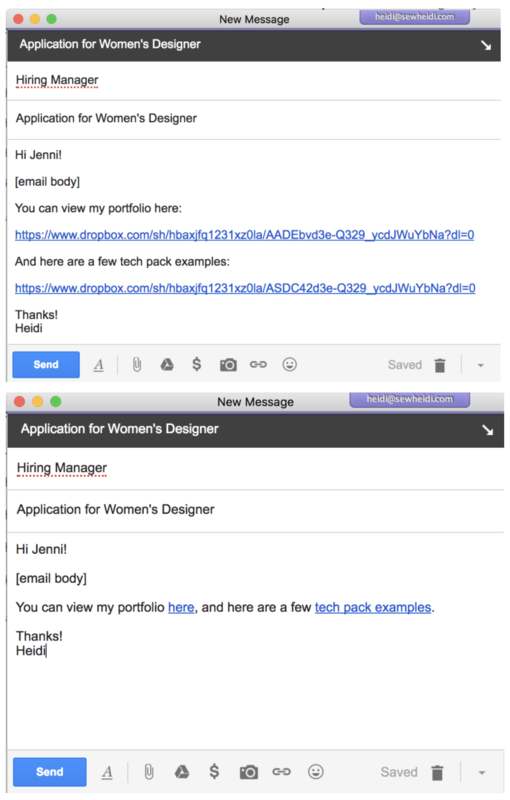 No one wants to receive giant email attachments, so how do you send your portfolio as a PDF? Use Dropbox. You can get a free account with more than enough storage. The reason I recommend Dropbox over WeTransfer or other file sharing services is that with Dropbox, your links don’t expire. Put your portfolio files there and link directly to what you want them to see. A week or month later, the files will still be available. Dropbox can also save you in a pinch when you accidently hit send and 30 seconds later realize you wanted to change “just one more thing!” on that layout. Edit your file in Dropbox and the recipient will never know. With services like WeTransfer, not only do your files expire, if you need to make a change, you have to write another email and send another link. That’s annoying for everyone, especially the recipient. Oh, and pro-tip: create clean links in your emails, it just comes across that much prettier. Just highlight the text you want to link and click the “link” icon in your email provider to paste the Dropbox link. Now, I know some of you will still want to create a website, and I get it. So, here’s my best advice on making a fashion portfolio website. First, pick a platform and move on. Don’t spend 3 months deciding what option to do and not getting any actual work done. There are no preconceptions about what platform you use, and brands won’t think “oh, she’s on Wix – ugh!”. It’s about your work…not the platform. Honestly, it doesn’t matter if you use Wix / Behance / Coroflot / Style Careers / LinkedIn / Adobe / WordPress / Squarespace. Do you have a kajillion LinkedIn contacts and engage a lot there? Put it on LinkedIn. Do you apply to a lot of jobs on StyleCareers? Put it on Style Portfolios. Do you have a friend who swears by Behance? Put it on Behance. Spend ONE hour MAX looking at the options, and then just make a decision and move on. Your focus should be on your work, not the platform. And remember…if a website terrifies you, then stick with a PDF. I promise, it works great. Can you bring an iPad to a fashion interview (instead of a physical portfolio)? I got varying thoughts from hiring managers and recruiters on this. Some brands really want the tactile experience of a book, some are ok with digital only. This is a judgment call you’re going to have to make based on what kind of work you do and the types of brands you’re interested in working with. The more “fashiony” a brand leans, the more important it’ll be to have a physical book and create a tactile experience during your interview. If you do choose to go digital only, a great way to compensate is by bringing a few sample garments to show during an interview . This is actually a great strategy even if you have a physical book too. Whatever format(s) you choose for your fashion portfolio layout, be familiar enough with your book that you can quickly navigate to the work they’ll want to see. If that means pulling pages out of your physical book before you go? Do it. If that means creating shortcut links on your iPad home screen for relevant projects? Do it. No one wants to sit there watching you fumble through a ton of pages looking for that perfect project. Because even 30 seconds feels like an eternity in an interview.